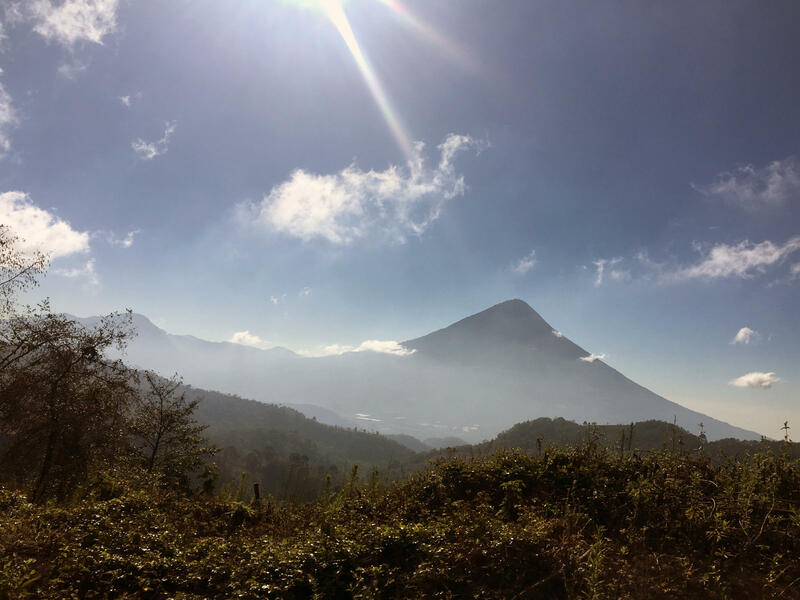 The Acatenango volcano is near the village of San Jose Calderas, many of whose residents were deported from a meatpacking plant in Iowa in 2008. Florencio Hernandez stands in the courtyard of the home he built using money from his jobs working as an undocumented migrant in the U.S. 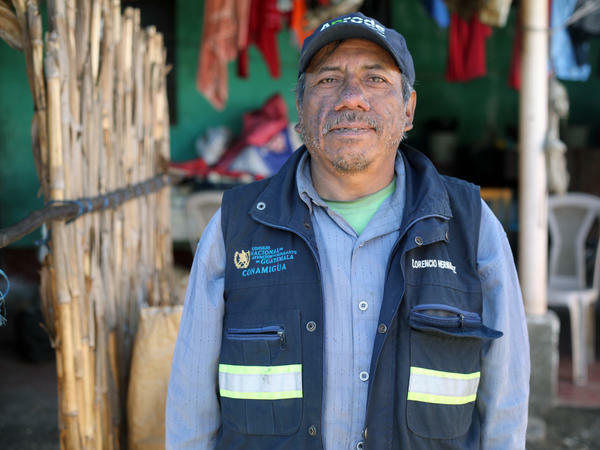 Following his second deportation in 2008, he now works as a tour guide in the volcanic region near the village of San Jose Calderas. Maria Lopez Santos sits in her home that was built using remittances from family members who worked as undocumented migrants in the U.S.
"I was born here, in the village of San Jose Calderas," says Hernandez, 56, gruff but friendly. "It was a very fertile place, we grew a lot of vegetables." When he was growing up in the 1960s and 1970s, Guatemala's civil war raged, leaving villages like this one isolated and without services. But they got by with what they grew — mainly corn and other vegetables — in the rich, volcanic soil. In the 1990s, the war limped to a close. It ended in 1996, after 36 years. But after a series of hurricanes, the "the land became sick," says Hernandez. Rain and wind eroded the soil. "And, in 1998," he says, "we had Hurricane Mitch, a powerful phenomenon." Crops were failing year after year. Facing hunger, villagers began to migrate to the U.S., looking for work. Hernandez left Guatemala for the first time in 2000, paying a smuggler thousands of dollars in borrowed money to get to Texas. He made it there without too much trouble, though he struggled to find work before landing a job in Dallas, cleaning a table-dancing bar. He was deported in 2003, but returned again in 2005, this time heading to a meatpacking plant in Postville, Iowa, where a stream of villagers had gone for jobs since the hard times started. He says hundreds of people from San Jose Calderas and the surrounding areas worked in that plant. His three sons came with him. Most people — including Hernandez and his sons — sent portions of their wages home. Those who stayed behind depended on those remittances. One was Maria Lopez Santos, whose husband, brother-in-law and one son also worked in the Postville plant. Now in late middle age, she sits very straight, gold teeth and pink dress bright against the gray walls of her San Jose Calderas home. "Before everybody started leaving for the States, all the houses were made out of canes and wire," she says. Some had tin roofs or walls, but there were only two houses made from bricks in the whole village. Hunger was part of life. Children often worked in the fields rather than attending school. "But thanks to the United States," she says, "those who knew how to think and manage their money began to build houses and buy vegetable plots." The remittances meant Lopez Santos' kids got through high school. The family built a house. The village prospered, if modestly. Then, one day in 2008, a shock: "We were coming down from the mountain, from our vegetable plot," Lopez Santos recalls. "And we met a woman and she said to us, 'Look, have you heard what happened?' And I said no, and she said, 'They caught our children.' "
U.S. Immigration and Customs Enforcement swooped on the plant in Postville, Iowa, in a raid that would become notorious. They arrested nearly 400 undocumented workers. Most were deported and a local leader says about 160 came back to this village. Juan Gonzales was a teenager in San Jose Calderas at the time. "When everyone was living over there," he says, "everything was great in the community." 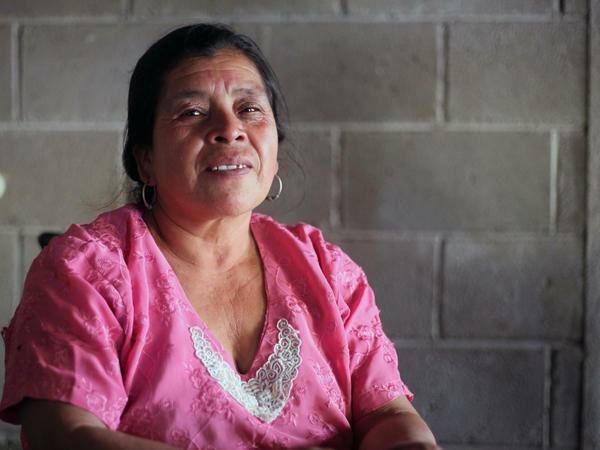 Although life in a village which many men had left could be strange for traditional, rural Guatemalans — for example, suddenly nearly all the attendees at village meetings were women — there was constant economic activity. There was building work to do, and work on the terraced plots of land people were buying on the side of the Acatenango volcano. Then, because so many people were deported and arrived back at once, everything changed abruptly. "This was so crazy in this community," says Gonzales. "No more money, not any work to do. Anything. Like, everything is coming down, breaks in this community." Some people had mortgaged their houses to pay for the journey to the United States, so when they returned and couldn't pay the mortgages, they became homeless. Newly impoverished neighbors found it hard to help them. All the progress — the houses, the schooling, the land people had bought — suddenly looked very fragile. In some cases, deportations have resulted in even greater destabilizing effects. Some migration experts worry that an uptick in deportation from the U.S. could fuel organized crime in Central America. "First, it could contribute to rising insecurity, as the allure of gangs increases and feeds on unemployed youth," says Anita Isaacs, a professor at Haverford College in Pennsylvania, who travels often to Guatemala for research on migration. The sharp increases in deportations intermittently discussed by the Trump administration could be counterproductive, she says. "The deportation could indirectly fuel gang violence," she warns, "and generate yet another wave of migration." There were more than 300,000 deportations to Guatemala during the Obama administration, according to Guatemalan government statistics. The recent rate of 30,000 to 35,000 per year continued steadily during President Trump's first year in office, but has jumped in the first part of this year: Guatemala counts 10,894 deportations up to March 22, versus 8,346 by roughly the same date in 2017. In San Jose Calderas, there is still a lot of poverty — some people still haven't managed to find new homes, and struggle to feed their families. But a spark of hope came three years ago, when one family restarted a dormant enterprise called Aprode, the initials in Spanish for the Association for the Betterment of Deportees. They converted it from a social support group into a tourism company, employing deportees as guides for tourists keen to hike the volcano and watch the sunrise from its summit. Guides earn about $40 for a two-day hike. Florencio Hernandez is one of the guides. Back in his courtyard house, he's washing up before setting off on an expedition. "Oh, I wanted a life in the U.S.," he says. "But this is the way things are and I had to accept reality." He heaves on a rucksack and trudges up toward the volcano.